This week's round-up is hosted by Linda at Teacher Dance. She's worked some magic with anagrams and the new spring that comes with March. Just amazing, her poem. I've been following A History of American Poets of the 20th Century with Lee Bennett Hopkins at Renee LaTulippe's No Water River. It's a rich presentation that includes readings from both Renee and Lee. Episode three is poets of the 1940s. 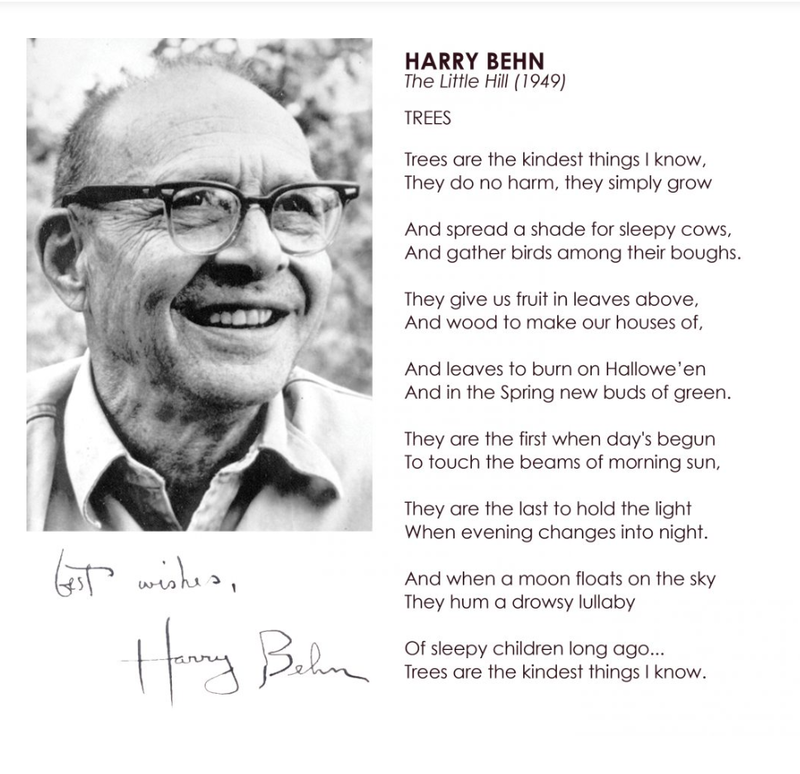 I fell for Harry Behn's poem, Trees and took Mr. Behn as my mentor this week. Your poem makes me want to share something too. Waking in a shhhhh-ed world of winter cold. pouring, mixing, flipping his best pancakes. Dressed in a zipped-up down-filled snow suit. racing sleds back down again - shrieking shrill. Snow day’s blanket covers the ground. Waving angels – our snow day best. My house throws out inviting light. sipping hot cocoa an answered prayer. Filling up on stories now and for later. Finds me fast asleep on my pillow. Thanks so much for stopping by. I am on a college preview tour with my high school senior. I may not respond to Poetry Friday comments and posts until later than usual. I'll catch up! 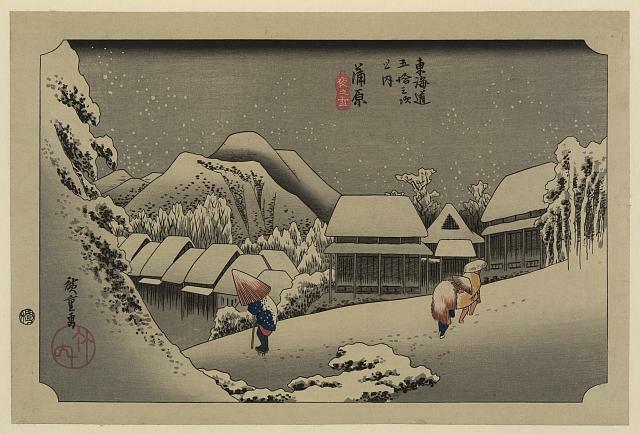 Andō, Hiroshige, Artist. Kanbara . [Between 1833 and 1836, printed later] Photograph. 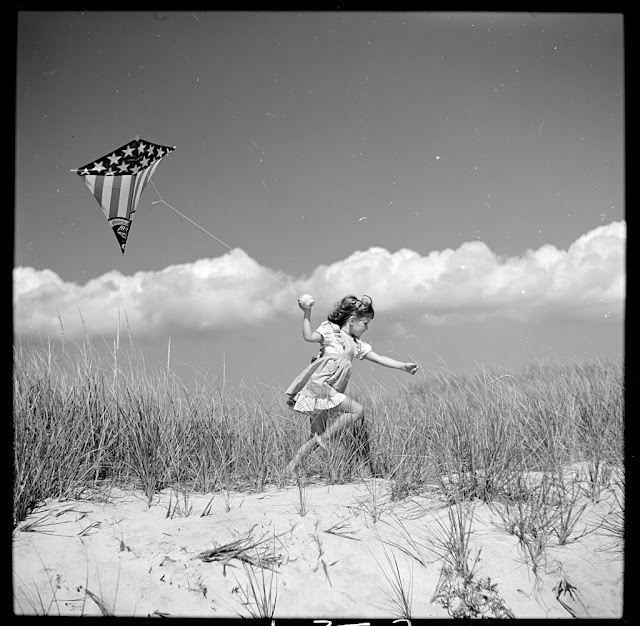 Retrieved from the Library of Congress, . UPDATE! Today, is a snow day for me. Ha ha ha ha ha. I can have fun with some Poetry Friday before taking off for the weekend. Find today's Poetry Friday round-up at Life on the Deckle Edge with Robin. She's creative in all kinds of ways (see her arsty letters etsy shop too! )...especially with words. Thanks to a snow day, I got to cuddle up with an amazing book, Countdown 2979 Days to the Moon by Suzanne Slade (Peachtree, 2018). I stumbled across Countdown by accident at the National Book Festival this past summer. I was with writer buddies walking around the crowded convention center, overwhelmed by all the choices and decided to stop for a rest at the Young Adult reading stage. Suzanne was talking about her book. Her enthusiasm for this nonfiction science story hooked me. I leaned in for a better listen. Then, I heard her say that the book is in verse. Well! That's something I want to know more about. 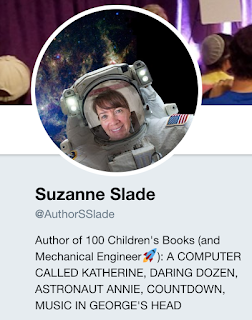 I was so taken with Suzanne as a scientist and author and images from the book she shared that I bought a copy from the huge table of books on sale. I don't think I can write just one account of how this book has impacted me. I need to break it down into how this book affected me as a reader, Teacher-Librarian and writer. I thought I knew some stuff about the space program. But, wow! Did I learn lots more. I love how this story begins with President Kennedy's proclamation and sets the clock ticking. There is no turning away from disappointments and failures...such as the deaths of astronauts Grissom, White and Chaffee in 1967. However, there are triumphs to celebrate too. I was caught holding my breath for each mission as they were incremental steps toward landing on the moon. I appreciated what is typically considered back-matter in a MG nonfiction book punctuating each chapter so I could process important details. Where astronauts went to school, how old they were at the time of their mission...if they are still living or not became important to me as I followed the Apollo journeys. Carefully selected photos from thousands, no doubt, complimented each interesting fact. Verse made this story accessible. Countdown was not a dense tome of reading. It is not a picture book that talks down to an audience. Countdown is the real deal for information and story. Like most grown-ups on earth, I compete for kid's attention. For some, time with a traditional book with pages is a tough sell. I cheer every time I come across a captivating MG nonfiction such as Countdown. Kids really do love nonfiction when given the chance to enjoy it in a high quality book. Ms. Slade trusts the readers to follow their curiosity through her story. I like that. Countdown is carefully crafted. Illustrations by Thomas Gonzalez are so finely made that one has to look closely to determine if they are paintings, photographs or a blend. 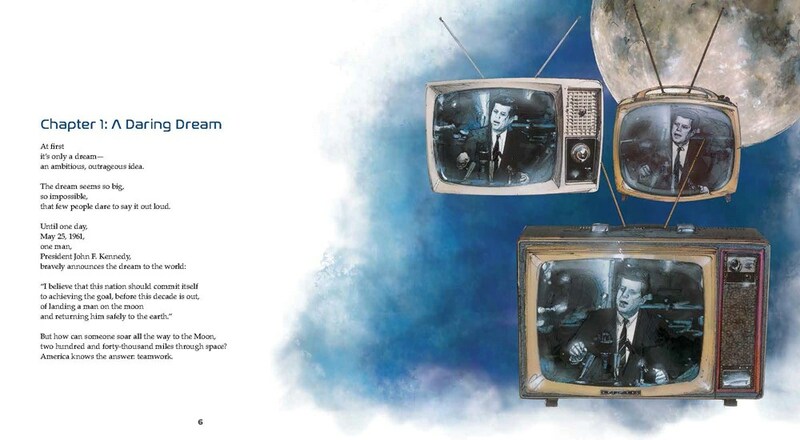 The artwork really does make the reader feel like they are with NASA. There is a ton of great science as part of the story. Words such as lunar, earth rise, Langrenus Crater, Sea of Tranquility, pitch, roll, yaw, trajectory...so many more. This book is stellar for building my own background information. I appreciate a Countdown Teacher Guide with activities for this book which is considered one of the Best Children's Books of 2018 by Smithsonian's Air & Space. 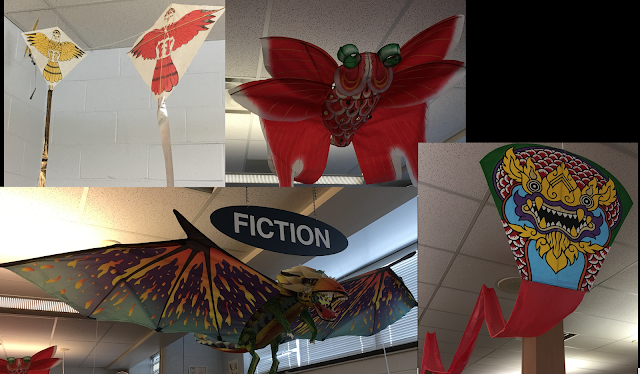 As a poet, I love the moment poetry is enjoying, especially in middle grade nonfiction. 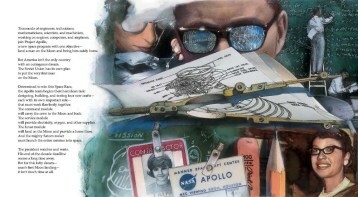 The opportunity to get to the heart of emotions in the Apollo missions was perfect for poetry. There was no shortage of figurative language. Enjoy these words from Countdown as as writing prompts. I bet you can launch your own poems about space exploration or many other topics. 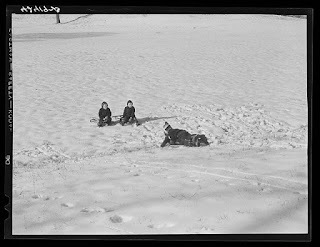 Thanks to ANOTHER snow day....I can post early and enjoy early Poetry Friday postings too. Yay! I was going to skip Poetry Friday. Seriously. It's been a busy week. I've not been feeling very energetic....I got home late tonight (Thursday evening) and I was sure that skipping one Poetry Friday would be no big deal. And, literally turning into my driveway at 7:20 pm I thought I heard my kid's 1st grade teacher's voice on the car radio. Three of my children had the same first grade teacher and I am delighted by that. Miss Stephens is the most amazing teacher you can imagine. She's an author and champion of writing. My kids who are fixing to leave high school STILL tell Miss Stephens stories. She is much beloved by our family. 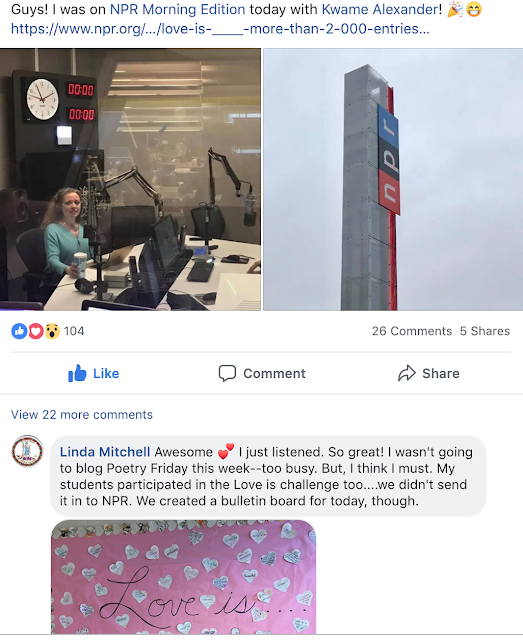 Did I hear Miss Stephens on NPR?! Kwame Alexander then used collected responses to create an original poem which you can hear on at the link to the Morning Edition show for 2/14/19. I invited students at my school to define love too. They did in all kinds of silly, serious, emotional, dark, fun ways on paper hearts from weeded books. Love is...getting to be a part of the lives of kids I know at my school for the brief time I get to know them. Love is teachers having as much fun as students in the library and saying, "hey....what if we make Love is...a black out poem? (awwww, Ms. C. you rock!). 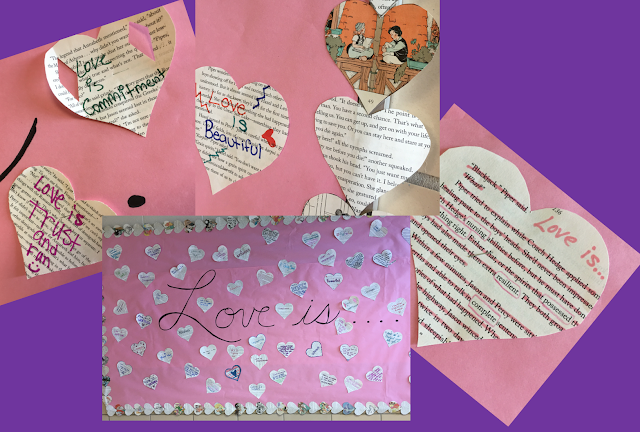 Love is a Library Assistant who goes with an idea last minute by leafing through discarded books looking for Love is...illustrations to cut out into enough paper hearts to create a border for a large bulletin board. Love is the community of folks that were part of Love is... including you. So, here I am blogging. And, I really didn't think I had time. Isn't that grand? Please visit Check it Out for this week's round-up of poetry love. Jone's holding a Cybils Award Party!